Avial is an important part of the Kerala Vegetarain Feast. 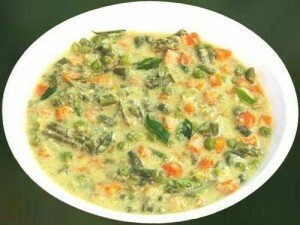 It is a thick mixture of vegetables, curd and coconut, seasoned with coconut oil and curry leaves. Vegetables commonly used in avial are elephant yam, plantain, pumpkin, carrots, beans, Brinjal,cucumber, drum sticks, snake gourd and avarai.It is supposed to have been invented by Bhima (one of the Pandava brothers) during their exile. Cut all the vegetables into equal pieces and place it on vessel. Now add turmeric powder, chilly powder, salt and sufficient water in a vessel and keep it on fire. Cover it and allow it to cook. Meanwhile you take the grated cocnut , cumin seeds, small onions, green chillies and curry leaves and grind them . After the vegetables are cooked add raw mangoes pieces in it and cook it with open vessel. As the magoes pieces are cooked well add the cocnut mixture along with sour curd to the vegetables. Remove from flame and the Avial is ready to be served hot.